In April 2016, Gov. Tom Wolf signed Senate Bill 3 into law, known as the Medical Marijuana Act (hereinafter “MMA”), which will begin the process of implementing Pennsylvania’s Medical Marijuana Program. With the implementation of the program, which is expected to take 18 to 24 months, comes the opportunity for patients who are under a physician’s care for the treatment of a serious medical condition, to be offered medical marijuana. 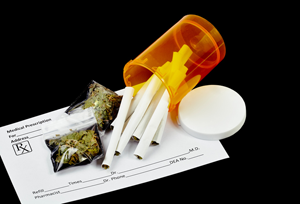 Knowing that some of the highlighted conditions may be caused by work-related injuries begs the question: Will workers’ compensation cover the use of medical marijuana for the above medical conditions caused by work-related injuries? Attorney Drew Gannon, a certified workers’ compensation specialist*, addresses the topic above and more. Where are we in the process of the implementation of the Medical Marijuana Act in Pennsylvania? Following the passage of the MMA in April 2016, an initial set of regulations was issued in October 2016 by the Department of Health setting forth parameters for the growing and processing of marijuana in Pennsylvania. To date, licenses have not been issued for manufacturing. The Department of Health anticipates publishing additional regulations pertaining to dispensaries (it appears medical marijuana will not be provided through normal pharmacy outlets), followed by regulations for practitioners, caregivers and patients. Given this timeline, it does not appear that medical marijuana will be available until well into 2018 at the earliest. Has the state determined yet if workers’ compensation will cover the use of medical marijuana? If not, when might that decision be determined? The MMA includes a provision stating that “Nothing in this act shall be construed to require an insurer or a health plan, whether paid for by Commonwealth funds or private funds, to provide coverage for medical marijuana.” This language is consistent with legislation passed in multiple other states and makes it doubtful that workers’ compensation carriers will be forced to pay for coverage. The Pennsylvania Workers’ Compensation Act, however, requires insurers to pay for medical treatment that is reasonable, necessary and causally related to a work injury. Further regulations will be issued, but it is uncertain whether medical marijuana will be covered under the Workers’ Compensation Act. This issue may be resolved by the courts. Of course, a workers’ compensation insurer can voluntarily agree to pay for medical marijuana. This decision will likely involve a cost benefit analysis in comparing the as of yet unknown expense of medical marijuana versus the cost of other narcotic medications which are being replaced. Also, the carrier may factor in the more benign effects of medical marijuana compared to the chronic problems often associated with long-term narcotic medications, including opioid addiction, when deciding whether to provide coverage. What are your biggest concerns regarding the future of medical marijuana usage following a work-related injury? As outlined above, the first concern will be the financial cost. If the patient obtains coverage or decides to pay out of pocket, the next concern is the impact the use of medical marijuana will have on an injured worker’s ability to return to work. The use of narcotic medications such as OxyContin / Percocet / Vicodin and stronger medications is already a concern in the workplace. Employers are in the process of updating and adapting their drug use policies to address the MMA. Employers have legitimate safety concerns about returning an employee to work who uses medical marijuana if that employee holds a safety sensitive position. Consider someone with chronic pain who receives sufficient relief from medical marijuana to be able to return to work. A highly paid electrical lineman, for instance, would not be permitted to work with medical marijuana in his system, and may be forced to take a lower paying, less dangerous position to avoid risks to himself and to other employees. It can be argued that the workers’ compensation carrier should be responsible for making up any wage loss which is attributable to the work injury and related treatment. The MMA does provide protection against discrimination / termination solely on the basis of someone who is certified to use medical marijuana, but also permits an employer to discipline an employee who is faltering at work due to the use of the medication. There are now at least 24 states that have approved medical marijuana, and the employment / legal consequences will be played out in the coming months and years. *Certified as a specialist in the practice of workers’ compensation law by the Pennsylvania Bar Association’s Section on Workers’ Compensation Law as authorized by the Pennsylvania Supreme Court.